We will be hosting an online brainstorming session exploring how to improve your digital learning. During this meeting we will brainstorm and use other creative thinking techniques on ways to improve your digital learning. Bring along a problem and the group will explore options to solve it. eLearnz 2019 is a virtual Web Summit that brings together the world’s top learning tech speakers. The growth of Artificial Intelligence (AI) is leading to transformation in our workplaces. Professor Klaus Schwab of the World Economic Forum is calling this change The Fourth Industrial Revolution. A webinar on how to develop and improve your content curation strategy for learning. 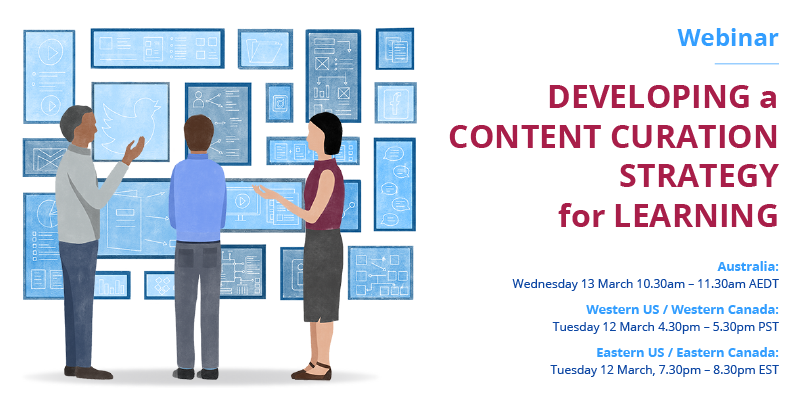 A free webinar on how to rapidly develop learning experiences without having to do the time consuming task of developing new content, by using content curation approaches. A webinar that explores the big trends in digital learning. Learning ecosystems are a powerful mindset for transforming learning. This webinar focuses on Sprout Labs’ ecosystems of learning technologies. The session will be a mixture of software demonstration and sharing the learning tactics that our platforms enable. This won't be a standard software demonstration. Learning technologies have a huge amount of promise for improving learning outcomes. Unfortunately, eLearning has become associated with self-paced linear modules that are often slide-based information dumps with a quiz at the end. An interactive webinar that explores what is microlearning, when to use it as an approach, and how it can accelerate learning while working.